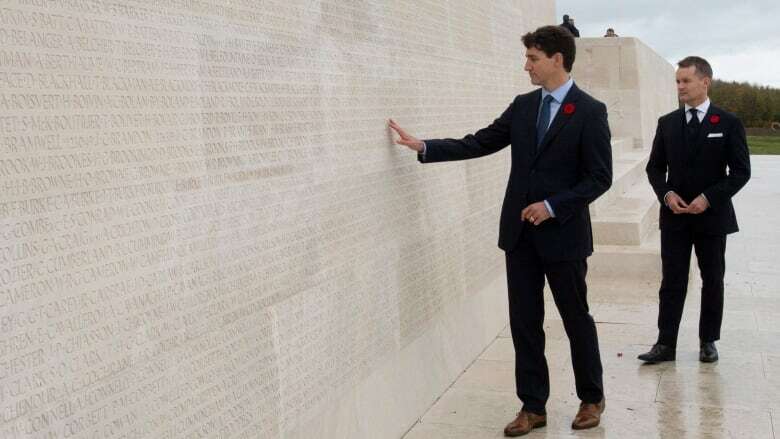 For Justin Trudeau and his Canadian delegation, there was an obvious place to start a weekend of commemorations marking the centenary of the armistice that ended the First World War: The still-pockmarked battlefield at Canada's National Memorial at Vimy Ridge. Dreary, damp skies and a chilling wind greeted the prime minister when he arrived off his overnight flight from Ottawa Saturday morning. But just as it was a century ago, Vimy Ridge remains a place for stoicism and national pride. "You stand for the values upon which Canada was built, values like democracy, equality, justice and liberty. And what I can barely know, you will never forget," Trudeau told a half-dozen representatives of veterans' organizations following a wreath laying in the small cemetery on the memorial's grounds. "From the very bottom of our hearts, thank you." It falls to subsequent generations of veterans to tell the story of Vimy Ridge today — the place where Canadian soldiers forged a national identity by fighting together for the first time under their own command. The words now inscribed on the massive hilltop monument describe their accomplishment in a succinct, understated style: "The Canadian Corps on the 9th of April, 1917, with four divisions in line on a front of four miles, attacked and captured this ridge." Canada's ambassador to France, Isabelle Hudon, said it's important to keep the memory of a "generation of extraordinary citizens" alive, honouring the sacrifices made both on the battlefield and at home. "These brave men and women have always stood up for Canada," she said. "Now it is our turn to stand up for them." 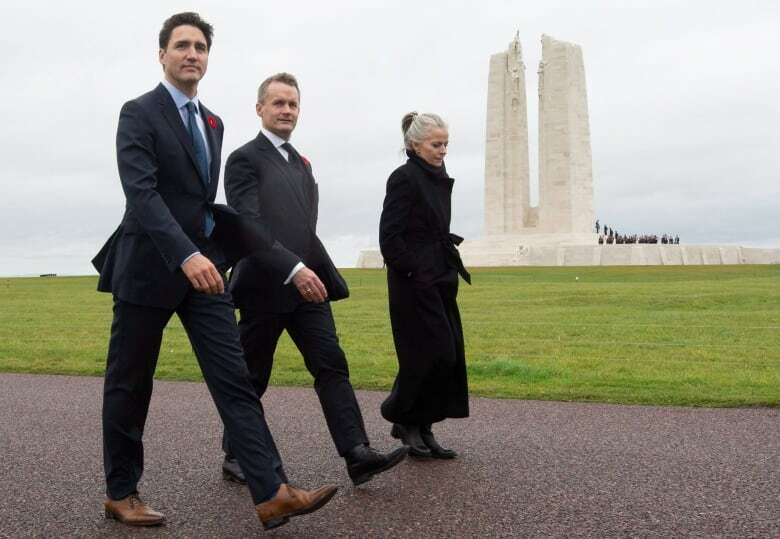 Veterans Affairs Minister Seamus O'Regan called the battle at Vimy, about two hours north of Paris near the city of Arras, the "battle that helped end the war," after months of devastating and brutal trench warfare against the Germans. "The price, though, was staggering," he said, metres away from grave markers of young Canadian soldiers, some of whose remains were buried unidentified. In his speech to the small gathering of a few dozen dignitaries and invited guests, O'Regan said reading the letters of First World War soldiers is a reminder of what they sacrificed "greatly and knowingly" to help build a better future for their young country. "Now we are free to choose our country's course," the minister said, drawing a straight line from the values that propelled the soldiers a century ago to the freedoms Canadians enjoy today. "We must remember the lesson of these conflicts: That freedom is not free. That it is not easy. Indeed it is hard fought," the minister said. "To remember those lessons is to remember those who fought these battles and who fight them still." O'Regan and Hudon joined Trudeau for a short Indigenous ceremony during their wreath laying. First Nations and Mé​tis veterans were among the half-dozen who met the prime minister and attended a short reception with the dignitaries following the prime minister's visit. Keith Williamson described how he believes he's the third generation to serve. He spent about 25 years in the reserves and regular forces, his father fought in the Second World War, and he believes a grandfather he never met fought with the Royal Navy in the First World War. He said it was an honour to be part of the armistice event at Vimy. "It was the first major battle that Canada was in," he said. "We had a tremendous loss of life ... Canada became a country, as it were." A small group of young people were also included in Saturday's commemoration. Pascal Morimanno, 16, was chosen to attend after telling his family's story in an essay competition. His great-grandfather fought for the British side in the final 100 days leading up to the armistice, including at the Battle of the Somme. He told reporters it wasn't lost on him that some of the grave markers at Vimy remember soldiers nearly as young as him when they were killed on that Easter Monday in 1917. On his way from the cemetery up to the hilltop monument, Trudeau stopped at a small grove of oak saplings, part of recent efforts to replace the original oak trees on the battlefield site with young trees originating in Canada. In the battle's aftermath, Canadian soldier Leslie Miller plucked a handful of acorns and sent them home to Toronto, where they grew into strong trees. Now volunteers are using the Canadian trees to regenerate the trees on the memorial grounds in France. There are now 100 saplings for the 1.6-hectare park, to coincide with the centenary. They're planted in four concentric rings, one for each of the Canadian divisions that fought the famous battle. Atop the ridge, the Canadian Armed Forces combined pipes and drums band played as Trudeau walked past the thousands of names of Canada's First World War dead. The rain held off as a soloist sang O Canada and La Marseillaise, the French national anthem. Then it was off to Paris for the prime minister and other dignitaries representing Canada at the international commemoration set to take over the heart of the city on Sunday, the 100th anniversary of the armistice agreement that ended the war. Saturday evening, French President Emmanuel Macron is hosting a private tour and dinner at the Musé​e d'Orsay for some of the 60 world leaders expected to be in attendance, representing countries that fought on both sides of what was supposed to be the war to end all wars.